Is your dog suffering from hair loss, itching bald spots, scabbing and sores? Then, it is about time you check your dog’s fur for mange or canine scabies. Mange is a parasitic skin disease in dogs that is caused by microscopic mites. There are two main types of mange – Sarcoptic mange, that are transferred between hosts and demodectic mange that are transferred from mother to pup during the first few days of life. Localized cases of mange remains confined to one or two small areas which causes scaly bald patches on the dog’s face. But generalized demodectic mange affects larger areas of skin or the entire body. It often leads to secondary bacterial infection that is an extremely itchy and smelly skin disease. The most resistant form of mange – demodectic pododermatitis remains confined to the foot and is accompanied by bacterial infection. Various types of medications are available to treat mange, but the treatment depends on the type of mange and the breed of the dog. Besides medication, a number of home remedies can also be administered on puppies and dogs to relieve the itch, soreness and irritation caused by mange. Benzoyl peroxide is the most important remedy you can use to treat Demodectic mites. These mites create a thick protective layer over the skin that covers the pores and follicles. Only Benzoyl peroxide has the capacity to scrape away this sludge and kill the mites that present 5 or 6 layers down. Once the sludge is cleared it also reduces the risk of secondary infection and build-up of yeast. Buy a shampoo containing Benzoyl peroxide. Use it to shampoo your dog as often as you want. It can be used daily also in order to get rid of the mites and maintain healthy skin condition. Not many of us believe it, but a good bath with soap and water is the easiest and most affordable remedy for getting rid of demodectic mange. Alkaline nature of the soap keeps the mange under control and kills the parasites responsible for the condition. It also reduces inflammation while washing away the oil, dirt and debris that cling to the skin and fur. Take a bucket of lukewarm water and soap. Give your dog a through bath. Make sure you scrub your dog’s body as hard as possible to dislodge the mites and wash them away. Hydrogen peroxide is a potent germicidal agent that is composed of water and oxygen. It destroys the mites and parasites through oxidation. You can use it alone or mix it with borax and water and apply it thoroughly on your dog’s skin and fur. Take 1% to 3% hydrogen peroxide on a clean towel. Rub the damp towel on your dog’s skin and fur. Be gentle around the eyes ears and paws. Don’t wash away the peroxide or it won’t show proper result. Don’t let your dog lick the hydrogen peroxide from its body. Continue this treatment for 2 weeks. Borax is a natural mineral comprising of sodium, boron, oxygen and water and it has the capacity to kill mites by reaching into the epidermis layer of the skin where the mange mites harbor themselves. But borax on its own can be too strong for your pet, so it is best to mix it with hydrogen peroxide and water. Prepare a solution by mixing 1% solution of hydrogen peroxide with 2 equal parts of water and enough borax so that the solution is fully saturated. Wash your dog thoroughly and lather this solution all over its body while the dog is still wet. Don’t let your dog ingest the borax. Let the solution air dry. Don’t rinse away or clean it off with a towel. The lather will turn into a dry chalky layer, which can be brushed away. Apply a soothing moisturizing lotion on your dog’s skin. Repeat this remedy 2 to 4 times for best result. Colloidal silver is a suspension of submicroscopic silver particles in a colloidal base. It has been used for ages to treat infections, scrapes and burns and it is extremely effective in treating bad cases of mange in dogs and cats. Colloidal silver is highly antimicrobial and it destroys the symbiotic relationship between microbes and insects which forces the mites out of the dog’s body. Mix some colloidal sliver with vinegar or olive oil. Apply this mixture directly to your dog’s skin including the insides of the ears. It can also be added to the bath water. Pure, unpasteurized apple cider vinegar (ACV) is a holistic method for treating mange. The acidic nature of apple cider vinegar creates an acidic environment on the skin of your pet and kills harmful bacteria and mites. You can apply it topically or add a small amount to your dog’s meals to speed up recovery. Bathe your dog with medicated shampoo and towel dry. Mix 1/2 cup of apple cider vinegar, 1/2 cup of borax and 1/2 cup of warm water in a bucket. Dip a clean towel into the mixture and rub it all over your dog. Make sure your dog does not lick it. Allow the skin and fur to air dry. You can also add a few tablespoons of apple cider vinegar to your dog’s meal. The high acidic nature of lemon juice kills the microscopic parasites and mites and promotes the healing process of the damaged skin. More over mites and fleas are repulsed by the citrus smell of lemon juice and they promptly evacuate the site after application. But, raw lemon juice can irritate the infections, so it is best to use it in diluted form. Cut a lemon into half and squeeze out the juice on a sponge. Coat the bald spots thoroughly with the sponge. You can mix equal parts of lemon juice and water in a bowl. Soak a sponge in the solution and rub it on the entire body. Repeat this remedy once a day for fast result. Honey helps to treat and cure mange in a number of ways. First of all, the viscous nature of honey forms a thick layer on the skin of your dog and cuts off air supply which suffocates the parasites and prevent them from reproducing. Honey also provides a soothing effect on the inflamed areas and reduces itching and soreness. Honey moisturizes the skin and prevents flaking. The rich stores of organic compounds in honey stimulate the healing process. Apply a thick coat of honey directly to the affected areas on your dog. Leave it on for 30 minutes to 1 hour. Wash off with soap and water and dry with a clean towel. One of the common side effects of mange infection is the secretion of crusty, discolored discharge from the ears of the dog. Acidophilus strain of bacteria found in yogurt eliminates discharge and relieves discomfort and itching. Make sure you use unflavored and unsweetened yogurt. Take a tablespoon of yogurt in a bowl. Take some yogurt on your finger and gently rub it on the scabbed areas of the ear. Leave it on throughout the day and wipe it off with a wet towel at the end of the day. You can also mix it with honey or apple cider vinegar and apply it to your dog’s ear. Aloe vera is well known for its natural antiseptic and anti-parasitic properties that kills the parasites and heals infections. Its anti-inflammatory nature reduces inflammation and soothes irritation, itching and soreness. You can apply aloe vera gel directly to the affect areas or mix it with borax or peroxide. Cut a leaf from the aloe vera plant and extract the gel-like substance with the help of a spoon. Collect the gel in a glass bowl and apply it directly to the affected areas of the skin. Leave it on to air dry. You can apply aloe vera gel to your dog’s skin as frequently as you want. Neem oil helps to deal with fungus, mange and other biting insects that attack dogs. The antiparasitic, antifungal and antibacterial properties of neem oil kills the parasitic mites and fleas and destroys the eggs of both demodectic and sarcoptic mites. Neem oil also improves the immune system function in dogs and speed up the healing process. Mix a couple of teaspoons of pure neem oil with apple cider vinegar. Dip a clean towel or sponge in the mixture and rub it all over your dog. Leave it on for 30 minutes and then wash off with soap and water. Olive oil works in a similar way like honey in treating mange in dogs. The thick consistency of olive oil forms a heavy coating on the skin and blacks out air supply, thereby killing the mites. It can also be sued to clean out the insides of your dog’s ears. Olive oil also soothes the inflamed skin and moisturizes the bald patches of skin that become dry and flaky. Take generous amount of olive oil in a glass bowl. Apply this oil generously all over your dog’s body. Leave it on for 1 hour and then wash off with soap and water. Pay special attention to diet – The diet of your dog must include optimum dosage of vitamin C, vitamin A, vitamin E, zinc, lecithin and B complex vitamins. Maintain proper intestinal health – Mange can get even worse if the dog’s immune system function is weak. So, make it a point to maintain proper intestinal health with high potency, non-dairy probiotics. Opt for fresh, home cooked food – It is best to feed homemade cooked or raw foods to your dog. Avoid canned or packed milk products and grains because sensitive dogs can be intolerant to milk and grains. Check out this post on 10 Foods Could Kill Your Dog. Clean the dog’s bedding periodically – Mange mites can hide out in your dog’s bedding or collar. So, make it a point to wash and clean your dog’s bedding frequently to keep it free from mites. You can use soap, hot water and bleach to cleanse your dog’s bedding thoroughly. Give regular bath to your pet – Bathing your dog with medicated shampoo helps to manage the generalized from of demodex that happens all over the dog’s body and causes intense irritation. A thorough bath cleans out the hair follicles and destroys the mites. Brush and comb your pet daily – Brushing the fur of your dog gives a good scrape and helps to remove scabs and scaly skin. Brushing also dislodges some of the mites from the skin. Don’t allow your dog to go near infected animals – If you suspect that a dog or cat in your neighborhood is infected with mange mites then keep your dog away from the animal. Maintain a clean environment – Vacuum your house regularly, spray insecticides on soft furniture and carpets to kill flea larvae and maintain a clean and hygienic living space for your pet. Clean your yard and garden and get rid of dried leaves and any debris of rotting vegetation. 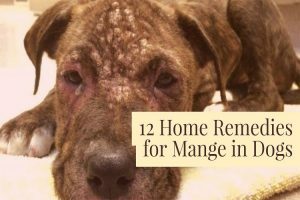 Most cases of localized demodectic mange are benign and can be treated with home remedies using natural ingredients. But severe cases of sarcoptic mange should be treated by a veterinarian who can run proper tests to diagnose the severity of the mange. The vet will prescribe medication depending on the diagnosis. See your vet before the mange infection turns severe and becomes difficult to treat. All the remedies mentioned in the article are effective in treating demodectic manage in dogs. Choose any one as per your convenience and try it regularly. The Demodex mite is the leading cause of hair loss and rosacea in humans. Also causes blepharitis. Much harder to eradicate than lice or scabies. My 11 month old border collie puppy has SRMA, an auto immune disease. Which, of course, means that his immune system is compromised. Because of this he has just developed demodectic Mange and the fur loss is around his eyes. College es are known to be sensitive to the usual tabs such as ivermectin so I have been looking at natural products to use especially since it is around his eyes. From reading your list it looks as if Need Oil is the best but is it safe to use near the eyes. This morning I used a weak solution of green soap, rinsed thoroughly and applied Aloe Vera gel, haven’t got a plant so used Forever Living. This is the first time I have encountered this problem so advice will be very welcome. Applying neem oil directly around the eyes can be irritating. Instead of that you can add few drops of neem oil into a small bowl of water and mix well. Dip a wash cloth in this and wring out the excess. Gently dab or rub the affected areas around the eyes. Repeat the process daily to provide some relief. My pitbull started loosing hair on her back and tail what is best to treat for this. I used borax and peroxide and it bleached her hair blonde. I found 6 puppies and have brought them home to take care if and give well being to before rehoming… They have been wormed and first shots… I have noticed little hard bumps on their heads and necks and they are in little tiny white patches .. The pups are 7 weeks old… They are not scratching and don’t seemed bothered with them…. Just concerned.. And what can I do for them to get rid of them??? ?